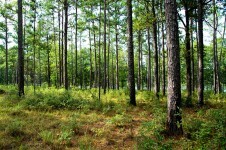 Archaeologists believe that humans have lived in Geneva County, Alabama for at least 13,000 years, perhaps much longer. During the coldest periods of the Ice Age, the Gulf Coast region would have been one of the few areas of North America that could be comfortably inhabited by homo sapiens. 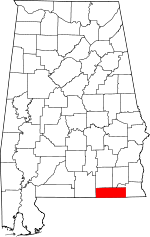 Geneva County is located in southeast Alabama, and its entire southern boundary lies along the northern line of the state of Florida. It is bounded east by Houston, north by Dale and Coffee, and west by Covington. The settlement that would become the city of Geneva was founded in 1819 as a trading post by brothers Henry Alexander Yonge and Walter S. C. Yonge. 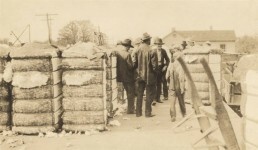 Soon they were joined by settlers from Georgia and the Carolinas seeking cheap farmland. As the settlement grew, Henry Yonge began to refer to the village as Geneva, after his wife’s home town in New York State. In the early days, the part of what is now Geneva County was a part of Dale County with its county seat at Daleville in 1845, but the seat moved to Ozark in 1869. 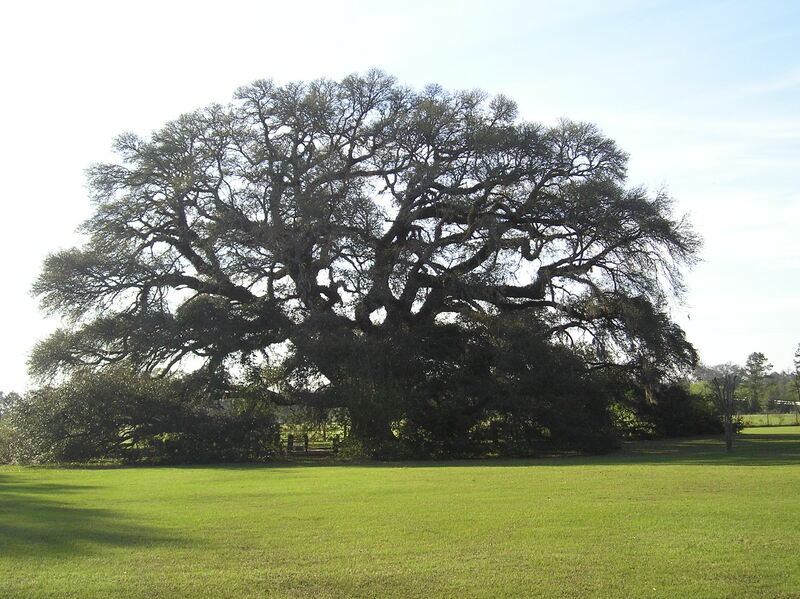 Geneva County has a historical big oak tree, also referred to as Constitution Oak, that is believed to be the largest and one of the oldest live oak trees in the state. The tree is believed to be about 200-300 years old. 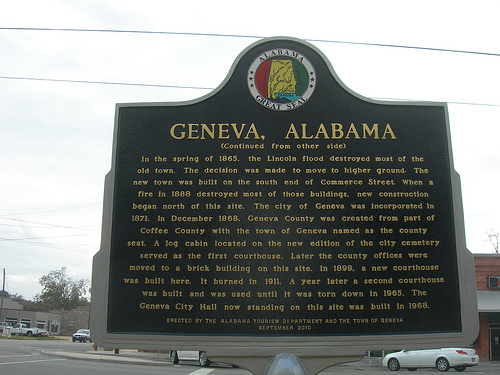 Geneva County, Alabama was named for its principal town, Geneva, which was also the county seat. As of the 2010 census, the population was 26, 790. Geneva is known as “Alabama’s Old River Town. 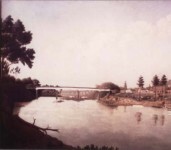 The town of Geneva is settled at the junction of the Choctawhatchee River and Pea River. Not far away is the imposing oak which has served as a backdrop to scores of weddings and community events and was one of the first subjects of nature artist Stephen Malkoff. 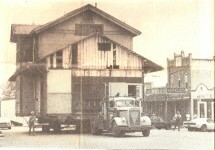 By the mid-1830s, the town had become an important center for trade and travelers. The Yonge brothers expanded their interests to a shipping company, owned with other town residents, and by 1836, Henry Yonge was serving as the town’s first postmaster. In 1865, the Lincoln Flood, named for then-President Abraham Lincoln, destroyed the town, and the residents reestablished Geneva higher up the river bank from the original site. 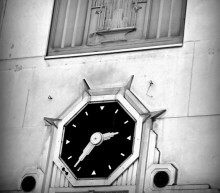 The Pace Hotel was the heart of the city. 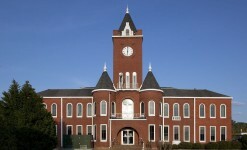 Geneva County was created by the legislature December 26, 1868. 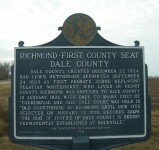 The act of establishment of the county named Thomas H. Yarborough, Daniel Falford, Daniel Miller, Asa Ray, William Hays, Ira D. Alberson, and Jonas Bell as commissioners for the organization of the new county. On the first Tuesday in January, 1869, they held an election for all county officers, establishing voting places, and appointing managers. The commissioners were required to levy a special tax to liquidate the pro rata indebtedness of the counties out of which the new county was formed. 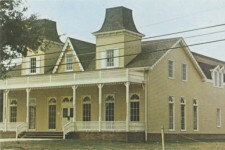 Pending suits were to be continued and tried in the old counties, unless by mutual consent they should be transferred, and all business in the probate courts of such old counties, pertaining to the estates of deceased persons who had resided within the limits of the new county, upon application or petition were to be removed to the newly established probate court. 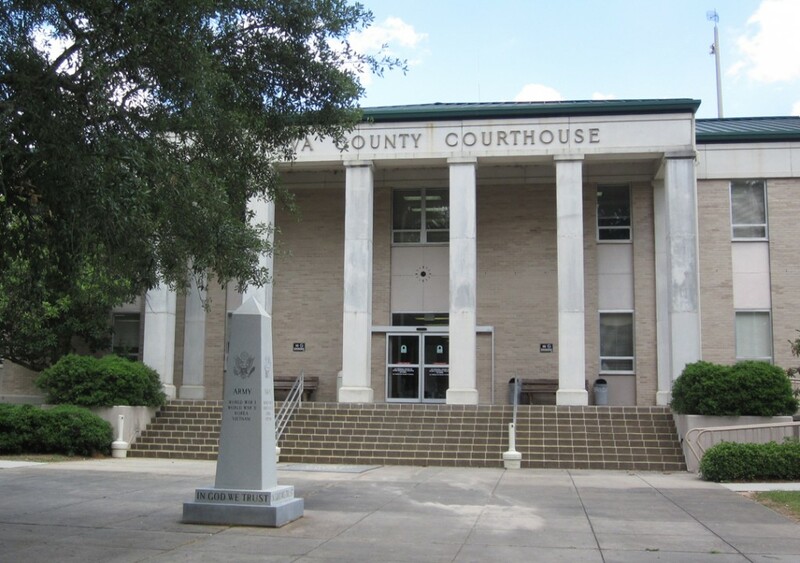 The county was attached to the Eighth Judicial Circuit, and to the Fourth District of the Southern chancery division. The Choctawhatchee flows through the entire extent of Geneva County. It was at one time the principal outlet for the products of the county. 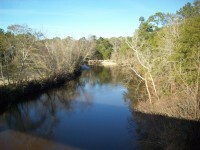 The principal tributaries of the Choctawhatchee in the county are Double Bridges Creek, which unites with it just above Geneva, and the Pea River just below. The latter drains the western section of the county. In 1929, the Hoover flood, again named after President Hoover, forced townspeople to build a levee with the help of the WPA. The “junction” was the site of the Union raid on the Confederate Steamboat, Bloomer. River traffic developed to the Choctawhatchee Bay and the Gulf of Mexico. Many river steamers began using the river to Pensacola and other ports until well after the coming of the railroads in the 1890’s. Jeremiah Pate from Tennessee fought with Jackson at New Orleans and was a captain in the Creek War, gave his name to the creek and landing on the river and with Thomas Sellers, Samuel and Jerry Tindell, and John Kinsaul, a Revolutionary War veteran, helped to organize Mt. Gilead Church in 1835, the third oldest church in the county. About one mile below Pate’s Landing are two Indian mounds, 10 feet high, and 25 feet in diameter. Below this point about three or four miles is a much larger mound. These mounds have many indications of house sites in the vicinity. There is archaeological evidence that present day Geneva County may have once been a major center of advanced Native American occupation. The location of the town of Geneva was the head of navigation for large sea-going trade canoes that traversed the Gulf Coast. A Native American town site is located one mile below Pate’s Landing on the Choctawhatchee River. The site contains two mounds that are still around 10 feet high. Around these mounds is extensive evidence of houses and long term occupation. Downstream about two miles is another mound, which is about 16 feet high. It also is surrounded by evidence of houses. Geneva County has received very little attention from professional archaeologists. It may contain many other Native American settlement sites, that are yet to be discovered. Among the earliest settlers of the Wiregrass was James B Ward born in 1796 who served as an Indian agent and did much to keep peace with the Warlike Creeks. He married Elizabeth English a charming Creek maiden, and they sleep peacefully on the Jesse Purvis farm near Malvern, now owned by Randall Collins whose mother was a Purvis. 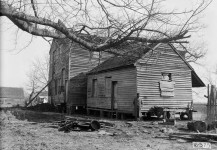 His labors were in Georgia, Washington County, Mississippi, Wakefield, Richmond, Daleville and Newton. This prominent couple has many descendants in the Wiregrass. 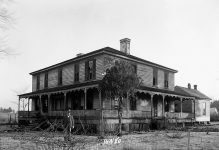 Many early settlers lived among the Indians, one of whom was Thomas Sellers born in 1813 and founder of one of our first schools named for him on Pate’s Creek. He also helped to establish Mt. 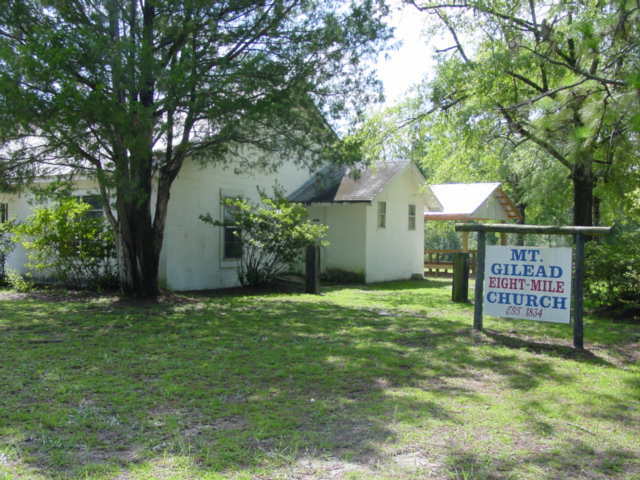 Gilead Church in 1838 and spoke the Indian language fluently. He has many descendants in Geneva County. Another early settler was Mary Bass, born in the county in 1822 and married John A. Hughes, Sr., who died in Selma in 1848. 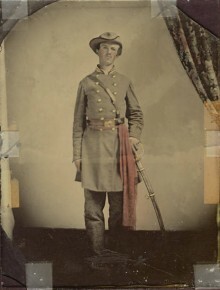 His father was colonel Joseph Hughes of Revolutionary War fame, who fought with Sumter at Kings’ Mountain while John A. Hughes, Jr. was the father of John J. Hughes a leading citizen and banker of Hartford, Alabama. Mary Bass Hughes married Love Turner and had two sons, Jim and Rufe. She was a prominent slaveholder and member of Mt. Gilead, where she was buried upon her death in 1889. The Hughes family has traced their ancestry to King Alfred and also to King Henry II and Eleanor of England. 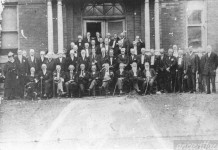 Many representatives of the family fought in the Revolutionary War, War of 1812, and the Civil War, and are most prominent in Geneva County. Among these are Albert, a former State Senator; Grady, a former county board of education member; and David, a county commissioner. The city of Geneva is perhaps most fond of its “Festival on the Rivers“, which began in 1976, and takes place annually on the last weekend in April. The entire town celebrates this special weekend. Civic Clubs, schools, church groups, businesses and commercial vendors take pride in being a part of this annual event. Ribbon of Love, a novel inspired by a actual people and true events. Great time to give the novel to a friend who likes historical fiction! Simply click here or on the picture below, and then click the box – GIVE AS A GIFT on the right of the page to gift it. Hi Sheila, My name is Vicky Peters Jimmerson, I went to Slocomb High, class of 1975. Johnny Keel was a year ahead of me and Linda and Glenda Keel was a year behind me. I noticed you made mention of Jeremiah Pate. Jeremiah Pate was my great great grandfather. Jeremiah Pate was my 3rd Great Grandfather on My Dads Mothers side, I just found all this out and I so want to go explore this area. I love this history stuff. I stay exited all the time finding new history. Have a Great day. How do the Global Warming Greenies explain to ending of multiple Ice Ages since there were so very few human inhabitants mostly Stone Age types, no coal using power plants or other large CO2 emitters back then? Wasn’t that global warming on a massive scale? Absolutely. Good to know there’s a few of us who look to history and use some logic. The ice ages referred to were caused by volcanic eruptions or asteroid strikes which threw lots of ash and other debris into the air. This stuff stay around a long time and would block the suns rays from warming the earth. So the ending of the ice age would probably be due to this debris finally clearing out. You can learn a lot from watching Discovey, History Channel, and The Science Channel. Via NationalGeographic.com: Scientists tend to huddle around one of two hypotheses that may explain the Cretaceous extinction: an extraterrestrial impact, such as an asteroid or comet, or a massive bout of volcanism. Either scenario would have choked the skies with debris that starved the Earth of the sun’s energy, throwing a wrench in photosynthesis and sending destruction up and down the food chain. Once the dust settled, greenhouse gases locked in the atmosphere would have caused the temperature to soar, a swift climate swing to topple much of the life that survived the prolonged darkness. The planet has gone through multiple warming and cooling cycles in its history, yes. No one denies that. The difference now, as many scientists working at the problem from multiple angles have shown, is that the current warming cycle is more rapid than those of the past and, *importantly*, strongly correlates with the onset of the Industrial Revolution. There’s ample evidence indicating that the current warming cycle is human caused. Can anyone provide an exact location (or suitable point of contact) for the Constitution Oak described in this article? It is in Fowler Park according to this article with directions. These pictures of the tree are pretty but nothing like seeing it in person. This tree is sooo massive. We have walked and sit on its limbs since I was a little girl. I’ve taken pictures of my kids under this tree and we’ve had wedding parties underneath it. When walking underneath your hidden, it’s like walking in a cave. Absolutely beautiful. I spent a lot of time under that tree growing up. My mother’s and father’s families have deep roots in Geneva County and surrounding areas. My mom’s dad’s family also “Homesteaded” land in neighboring Holmes County, Florida which we still own to this day. Love this tree!! The commissioners for the establishment of Geneva County listed needs correcting to Ira D. Alberson not Albenson. The D stands for Drayton, he is my GGG Grandfather. I was born and raised right here in Geneva and I live less than a mile from The Constitutional Oak today. I graduated Geneva High School in 1996 and as many others have done before and since, we had our graduation ceremony in the gazebo that is overlooked by the massive tree. I love the Oak. As a child I can remember the wonder and awe as well as the curiosity inspired by it. Imagine the faces that have looked upon the Oak and the changes in everything that it has lived through. I would, however, like to know where the native american ruins are. I have always been fascinated by what’s beneath my feet. Boring old Geneva isn’t so boring after all…. Thank you for this article. Charley, may I offer that of simply asking the question regarding Native American history in the area, go look for it. Hit the library, or any other place where references to the area might be found. Interview some of the more elderly people who have lived in Geneva for decades. Search out old maps regarding the trail. Contact the Chairman (also known as the Chief) of the Creek Nation. Though it might cost some money, subscribe to Ancestry.com and start doing name searches to see who may well still live in the area, and also be of Native American decent. Look at the Baker and Dawes Rolls, though these rolls are incomplete as not all Native Americans wanted to list themselves on the rolls. Doing so could bring stigma to them and their families (this I know personally). I hope, if you are truly interested in pursuing this, the information I provided will help you get started. Best wishes, and O’siyo!! real good reading if you are interested in such. Lee Gilman Dykes, this is a neat article! Yes! I’ve seen this article. It is neat. We Geneva Countians have roamed the land for many years. Ha! Wow!!! That is very interesting! “The “junction” was the site of the Union raid on the Confederate Steamboat, Bloomer, in 1860.” Is the date a typo as I could of swore the Civil war started on 12 April, 1861 when the Confederates opened fire on Ft. Sumter. It probably was. I just took the date out. Thank you for the correction. Yes ma’am!! Born and raised in Geneva! Graduated in 05′ next to the beautiful Oak tree. A great place to grow up and raise a family. Wouldn’t change it for anything. Hoping one day to move back and continue in the traditions with my son. Being a resident of Geneva this makes me appreciate an outsider comin in and not havin ugly things to say about this sleepy l’il town. My Grandmother was a Bass and her husband was a Brown. These are the same grandparents that sharecropped on Esto Highway. I have seen this tree! My mother lives in Hartford. Next to Geneva. I somehow knew you were in on this somehow. I checked online with ancestry.com and found my family lived here 12,980 years ago…..
My mother is from Hartford and my dad from Geneva! Debra Richardson Sellers, is that your special tree? I’m a BLACK (AL) girl! Played in and around this tree forever growing up! Took my boys a few years ago. My Memaw is still in Hartford! I live in Dothan, that is one big tree in Geneva! Constitution Oak is an amazing tree. So they were here before God created earth. That’s the thought I had! I believe the Earth is about 6000 years old. Sorry but I still have trouble believing the “6000 year” age of the earth. But hey, with God I guess it’s always possible.